If you have an underactive thyroid you will be interested in anything you can do to fix it, preferably without a drug. Please read through the other blogs on ways to improve thyroid function to get a good overview – I’ve done quite a few thyroid posts. Here I want to tell you about another very important mineral which may help you significantly, and why, and it’s not selenium this time (although this is very important to take). It’s the same mineral people take for thick hair and strong nails – but let me tell you more about it – I think you’ll be amazed at what it does. 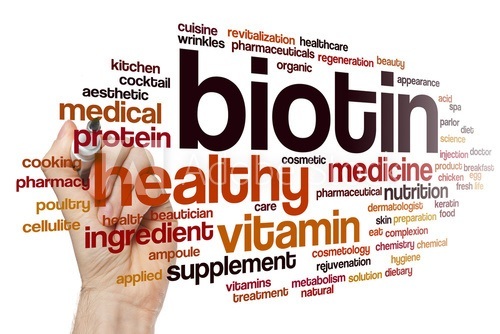 Biotin is a life-sustaining nutrient which you need very little of – but probably don’t get nearly enough of. It’s generally found in very small amounts in B-Complex supplements, but generally in amounts too small to have the desired effect. Also called Vitamin H, Co-enzyme R, d-biotin and Vitamin B7, Biotin is helpful in heart conditions, blood sugar control and wound healing, and while some is made by your gut flora, often the microbiome is not what it should be, so you don’t make nearly enough of what you need especially as you get older. Biotin is involved in fatty acid synthesis and helps to make healthy myelin while giving you lots of energy. The myelin sheath is the covering around nerves and the spinal cord which is essential for people with multiple sclerosis (MS), and is very helpful in this condition according to studies, and shows enormous promise for this disease. Did you know that 25% of your thyroid hormone is made in your intestines? This means if you have dysbiosis or gut dysfunction, your ability to product this hormone is compromised, that’s why gut health is absolutely pivotal. It’s back to the old adage – it all begins in the gut, both health and disease – and keeping your gut healthy will keep the entire body healthy too. While biotin increases the inactive T4, it does not increase the conversion to the active form, T3 – this is where other co-factors come in. Do you eat a lot of raw egg whites? Is there a scaly red rash around your eyes, nose, mouth and genital area? Do you have very slow wound healing? Is your heart rhythm irregular? Do you have acne and eczema? Do you have unusual facial fat distribution? Are you depressed, lethargic and even may have hallucinations? Do you have thin hair and nails? Have you been on antibiotics recently? Do you not take a probiotic daily? Do you have loss of appetite and/or nausea? Do you experience a prickling sensation in hands/feet (paraesthesia)? Are you experiencing skin inflammation such as seborrheic dermatitis? Do you have itching and flaking of the scalp? These symptoms taken together, are very typical of a biotin deficiency, but many can apply to other conditions as well. Interestingly, much attention is paid to folate in pregnancy, but biotin is equally important in the developing foetus. Biotin has also showed promise in the treatment of MS, diabetes, and less important conditions like hair loss and brittle fingernails. Best food sources include animal meats, fish and egg yolks. Smoking increases biotin depletion (including vaping) and a compromised digestive system will make it difficult to make your own biotin. Taking more than the recommended dose of biotin may mask thyroid blood tests. Stop taking it 3-5 days before a blood test if you are taking very high doses (anything from 2g upwards). Less than this and you don’t have to worry. The Biotin in my online store is only 30mcg – so taking one or more of these a day is nothing to worry about. More is not better – take only what is needed – it does the job well. Take it away from seizure medication – take it but not at the same time. It’s advisable to take a B-Complex with it, as taking one on its own long term depletes the others – the B’s like to stay together.